The Jelly Belly people have announced a fun and fantastic chance for candy lovers to make $10 000 in prize dollars – that is a lot of candy money! The prize is for the most creative jelly belly cupcake in the world. Those who are keen to enter need only make, bake and photograph their best cupcake creation, topped with Jelly Belly’s of course. Actually, you don’t even have to bake the cupcake. This contest is about Jelly Belly’s so that’s what the judges and fans care are looking for; creativity with Jelly Beans. You can actually create on top of a ready made cupcake. The hard part of course will be having the most amazing idea in the entire world. Well, even if you don’t come up with the best cupcake in the whole world, the cupcake challenge is also offering over 2000 instant prizes so it’s worth a shot. Once you have created your cupcake, photograph it and then submit it to the contest through the JB contest website, and then all you have to do is wait. The way the contest works is that the top five best cupcakes will square off in a final to be voted on by cupcake/Jelly Belly fans. Fan votes will be calculated to choose the grand prize winner. Besides 10 thousand dollars in cash the promoters are giving away some really neat instant prizes which include Jelly Belly tote bags, charm bracelets (made of sterling silver not jelly) and jelly beans of course. 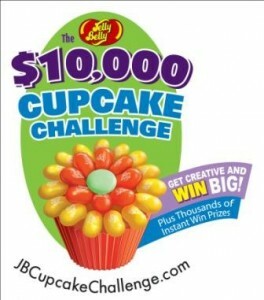 Those who have the creative Jelly Belly talent and want to enter the contest fray can do so right up until July 31, 2011. That’s heaps of time to come up with the best cupcake on the planet.